Resorts of Ontario (http://www.resortsofontario.com), Ontario’s premier association of resorts, inns and lodges, is pleased to launch our new magazine Go Resorting just unveiled at Casino Rama in Orillia , April 8, 2013. This exciting new Ontario tourism and vacation magazine includes fun vacation stories of inspiring resort experiences and stories by professional travel writers. 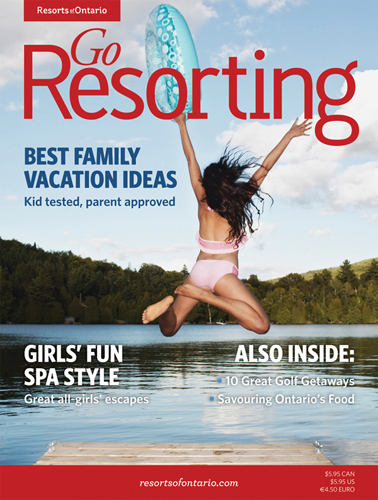 Go Resorting magazine includes interesting topics that relate to vacationing at Ontario resort, lodges, cottages and inns, including romance, culinary, family, golf, spa and more. The inaugural edition of the magazine features several informative articles, including “Best Family Vacation Ideas”, “Great All-Girl Escapes”, “10 Great Golf Getaways” and more. A contest is featured in the magazine which we hope will be shared through social media. The contest runs until September 30, 2013. Enter your “My Favorite Go Resorting Moment” now at www.resortsofontario.com or tell , share or show us via Blog, Twitter, Face Book or Pinterest.